Capella (The Food of Love, 2004) again mingles amore with alimenti in this tale of a British officer who develops an appetite for all things Italian. In February 1944, Captain James Gould is sent to Naples to enforce an army policy discouraging British soldiers from marrying Italian natives. The inexperienced officer is quickly put on the offensive when confronted with bribes and brides. James clamps down on the black market and takes a hard line when dealing with locals. They devise a ploy to soften his governance by attacking his taste buds: “A man who has eaten well—he’s at peace with the world…he wants other people to be happy.” So the black marketers place beautiful and talented cook Livia Pertini in James’s kitchen. 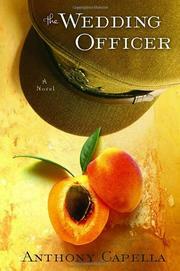 He tries to resist (it’s career suicide, after all), but soon the young officer is under her spell. James reverses his stance and starts approving batches of marriage applications; he even aids the locals as they attempt to reopen businesses. Livia is standoffish at first—she’s a recent widow, and the Allies treated her family vilely—but eventually she succumbs to James’s clumsy seductions. Capella does a capable job capturing the essence of war-torn Italy, but his prose becomes transcendent when he pours his heart into telling the story of Italian food. Readers will appreciate the recipes for sugo (a basic tomato sauce) and other classic Italian dishes; even the most fastidious dieter may consider a pasta binge. Disappointingly, the love story isn’t as appetizing as Livia’s fettuccine al limone. An overwrought romance spoils a lovely feast for the senses.